One of the most undesirable results of taking photos is the red-eye effect. In photography the red-eye effect occurs when a camera captures light reflecting from the retina of the subject’s eyes or when a flash is used at night and in dim lighting. This is a pretty common effect that all of us experienced at least once and it’s easily preventable by turning off the flash of the camera. Unfortunately, no flash at night means no visible subject in the photo. So, what to do in case we cannot prevent the subject’s red eyes? Luckily, there are countless programs, phone apps and web services that can help removing red eyes and fix the photos. They often requires to manually select the subject’s eyes and automatically remove the red layer on top of them. Here at Filestack we provide a better solution, which does not require any manual selection but relies on the awesome Filestack image processing API. 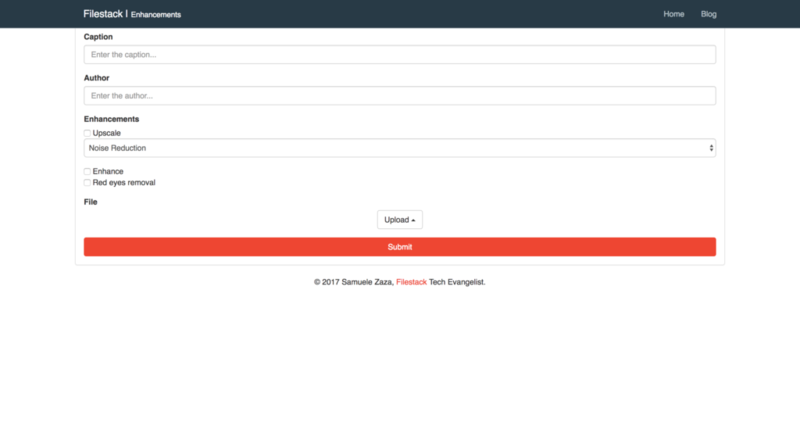 Filestack’s red eye removal transformation is easy to integrate in your codebase. Let’s see in action with React! This is going to be a simple app made to demonstrate how Filestack remove red eyes from your photos. As always, you can clone/fork it from my github. There are two views in the app: A main page where the enhanced photos are listed and a /add view to enhance and send the photo to the server. 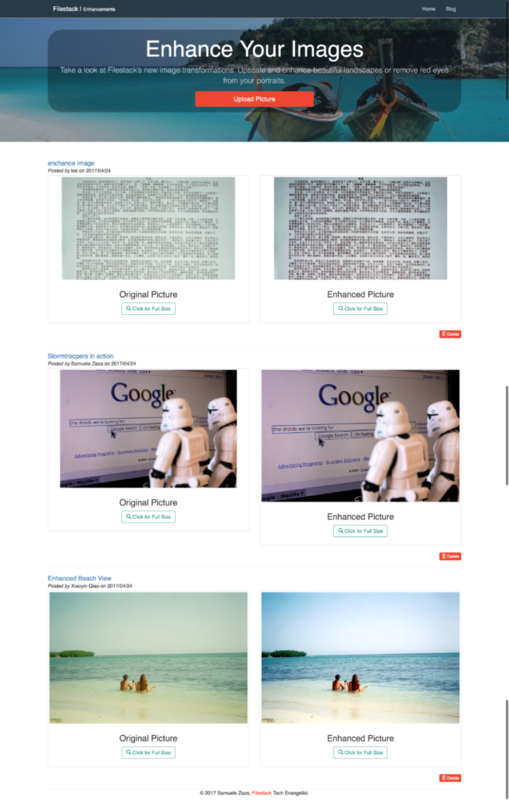 Both the original and enhanced pictures are stored in the json database and shown beside each other to highlight the enhancement. The /add view is not just about red eyes removal but other enhancements are available to users. Furthermore, this where we integrate Filestack, pick and the process API. There is no image enhancements without the possibility of uploading the a picture. We are going to use filestack-js, the new npm package you can simply install from the terminal. 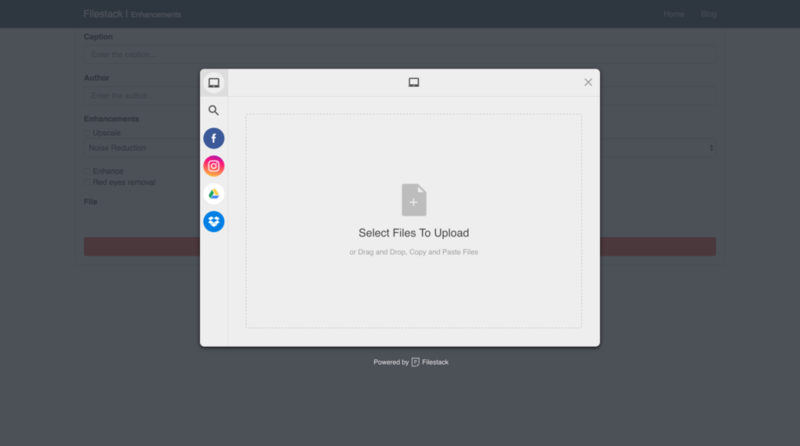 The minimalistic UI allows for drag-and-drop or file uploading from different sources listed on the left. Curious about the code? You are gonna be surprised by its simplicity. We first call filestack in charge to run pick. We set 2 constraints in the options parameter; the uploader only accept images whose size is within 10Mbs. Once the promise resolves we receive a response carrying information about the newly uploaded photo. We take handle. you can see handle as a unique string representing the specific photo. Finally, the handle is set in the app state along with the transformation. However, this renders only the original image but we want to enhance it by removing the red eyes instead. Thus, we need to complete the photo URL with the specific process API syntax.